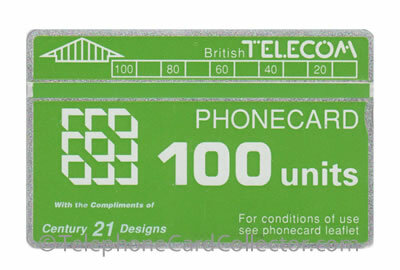 The BT Phonecards shown below are all unique in the fact that they don't appear in either the UK 1 BT optical card catalogue or the UK 2 BT chip card catalogue. 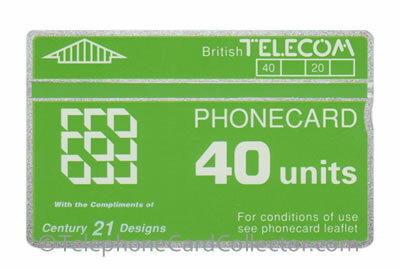 Some of the telephone cards shown below have previously unknown or unlisted batch and control numbers, others are unofficial overprints, while some have never been seen before. Pictured above: A 5th series 100unit definitive BT Phonecard with the unofficial overprint wording "with the Compliments of Century 21 Designs" in the bottom left hand corner of the card. What's a unofficial overprint? 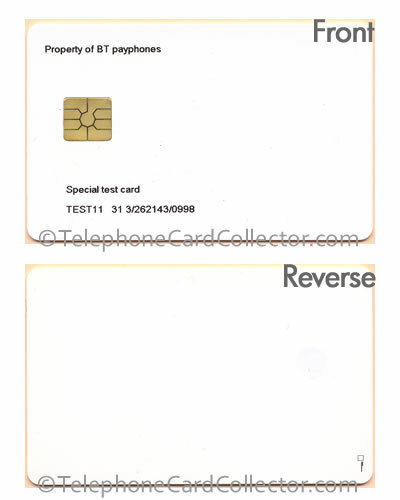 An unofficial overprint is a card that has been overprinted by a private individual or company and has not been produced by the phone card manufacturer e.g. Landis & Gyr to advertise a product and/or service. Please note: When the UK catalogues were produced it was not their policy to catalogue privately overprinted cards. 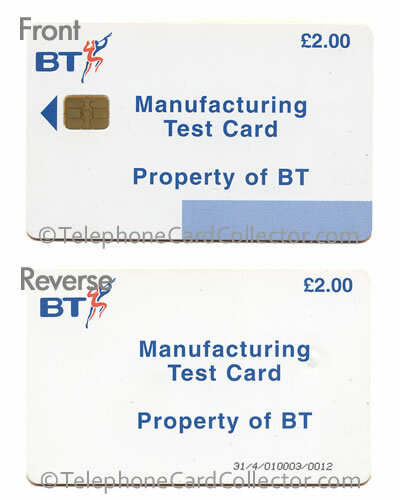 Do you have an uncatalogued BT Phonecard that does appear in any UK catalogue and isn't pictured below? If you do, please email a scan, so I can add it to this page and share it with other collectors. While the above card is catalogued, this card carries a batch number of 010003. Special Test Cards 1, 2, 3, 5 and 7 cards are catalogued. 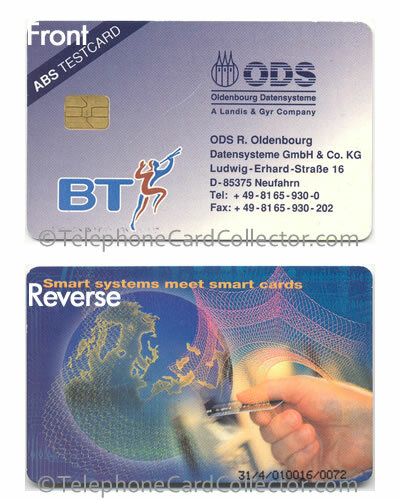 The above card is Test 11. 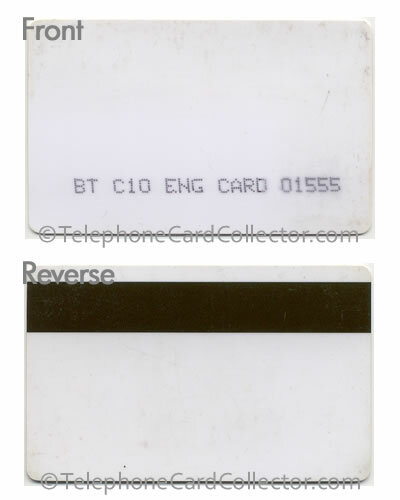 While the face of the card may look like TST020/021 the reverse is very different. 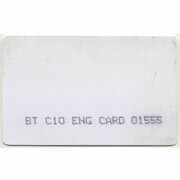 Magnetic 'swipe' BT engineering card. Used as a test card? BTD023 - 5th series definitive 10unit with 'Century 21 Design' overprint. BTD024 - 5th series definitive 20unit with 'Century 21 Design' overprint. BTD025 - 5th series definitive 40unit with 'Century 21 Design' overprint. BTD026 - 5th seriers definitive 100unit with 'Century 21 Design' overprint. 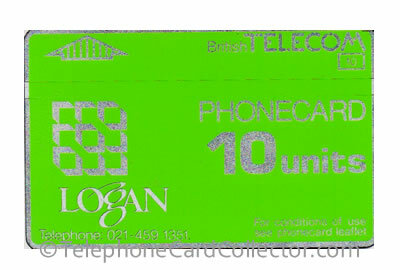 BTD013 - 3nd seriers definitive 10unit with 'Logan Telephone: 021-459 1351' overprint. 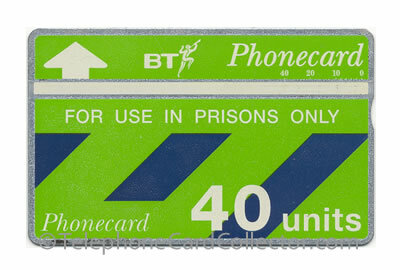 40unit Prison Only phonecard controls number prefixes seen are: 110C, 204A and 208F. 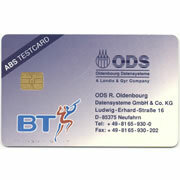 Do you have an uncatalogued BT Phonecard that does appear in any UK catalogue and isn't pictured above? If you do, please email a scan, so I can add it to this page and share it with other collectors.